Tipperary County Council was established on the 1st June, 2014, following a decision in 2011 by the Department of Environment, Community and Local Government (DECLG) to amalgamate North and South Tipperary County Councils. 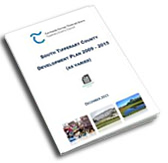 South Tipperary County Development Plan 2009, adopted in February 2009. 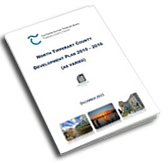 North Tipperary County Development Plan 2010, adopted in July 2010. The existing County Development Plans have both had their lifetimes extended (11A Planning and Development Act 2000, (as amended)), and will remain in effect until a new Regional Spatial and Economic Strategy is made by the Southern Regional Assembly, thereafter a new Tipperary County Development Plan will be made. The Council, in order to provide a unfied vision and strategic planning framework to support the future economic, social and community development of the county has carried out a variation process of both County Development Plans. The written statements of both plans have been replaced with a common written statement incorporating consistent policies and objectives across the county. In the interest of consistency and ease of presentation, both the North and South Tipperary County Development Plans have been republished to incorporate changes made as a result of Variation Number 1 and Variation Number 2 of both Plans. The most recent editions of both the North and South Tipperary County Development Plans and all maps and appendices are presented below. Variation Number 1 of the North Tipperary County Development Plan 2010 was made in November 2011 and Variation Number 1 of the South Tipperary County Development Plan 2009 was made in June 2011. These variation processes incorporated changes to both Plans including the insertion of a Core Strategy as set out in Section 10 of the Planning and Development Act 2000, (as amended). 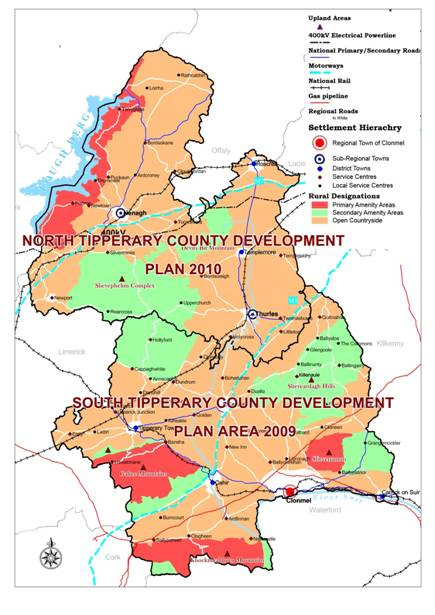 Variation Number 2 of the North Tipperary County Development Plan 2010 and Variation Number 2 of the South Tipperary County Development Plan 2009 were both made in December 2015 and establish consistent policies and objectives in both Plans in order to achieve a coherent approach to development on a countywide basis. In order to achieve consistency, the written statements of both the North and South Tipperary County Development Plans have been replaced. Variation Number 3 of the North Tipperary County Development Plan 2010 and Variation Number 3 of the South Tipperary County Development Plan 2009 were both made in September 2016 and incorporate a new Renewable Energy Strategy 2016 for Tipperary. The Renewable Energy Strategy is set out as Appendix 6 of the County Development Plans and incorporate a new Wind Energy Strategy. A settlement Plan for Fethard was incorporated on the 10th April 2017 and replaced the Fethard Local Area Plan 2011. Variations of the North Tipperary County Development Plan 2010 and the South Tipperary County Development Plan 2009 were both made on the 8th May 2017 and incorporated the provisions of the Planning and Development Act (as amended by the Urban Regeneration and Housing Act 2015). The legislative mechanisms include the establishment of a vacant site register and levy to incentivise development and bring sites into beneficial use. Variations of the North Tipperary County Development Plan 2010 (as varied) and the South Tipperary County Development Plan 2009 (as varied) were both made on December 11th, 2017 consists of revised Settlement Plans for towns and villages identified as ‘Service Centre’, ‘Local Service Centres’ and Settlement Nodes in the County Settlement Strategy and Hierarchy. The appropriate maps and graphics required to illustrate planning policy are inserted as PDF documents into the planning policy documents of both Plans e.g. settlement plan maps. Furthermore, geographic information related to planning policy, e.g. Special Areas of Conservation etc can be accessed on the interactive planning enquiry system, see link below.